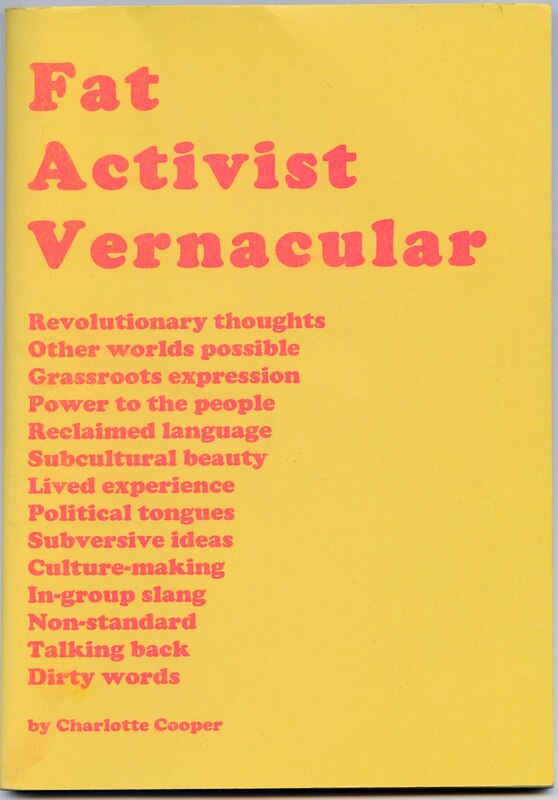 I'm excited about the imminent arrival of Catherine Redfern and Kristin Aune's book Reclaiming the F-Word, I hope it helps give British feminism a shot of third wave energy. 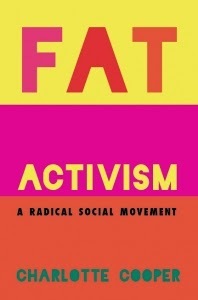 Whilst it's great that the authors have noticed the emergence of a new wave of fat activism in the UK, one that is informed by third wave feminism and DIY culture, I have mixed feelings about being mentioned in this book. The problem is that the authors have got a bunch of us mixed up. In a tiny sentence halfway through the book they write that Unskinny Bop, Big Bums and Obesity Timebomb are more or less the same thing, produced by the same people. d) We all know each other. There are other fat activist things going on in the UK too, like The Chubsters, Fat Studies in the UK, The Fat of The Land, things being published, to name a few, but these have not been mentioned. It wouldn't have taken much to check the basic facts, we're pretty accessible, and it makes me wonder about the reliability of other information in the book. Maybe none of this matters, perhaps a general idea that fat feminist stuff is going on is enough. I think the reason that this miniature oversight bugs me so much is that Tamsin, Ruth, Bill, Kay and I are always being mistaken for each other. Bill and Kay even made a Spot the Difference quiz in our zine, Big Bums. Bill's girlfriend Donna, who is not fat like the rest of us, gets it from time to time too. Bill and Kay are similarly mistaken for Ingo, who runs Wotever World, who also has short hair, a masculine demeanour, specs and fatty queerness in spades. It's lucky that I love my friends and dig what they do because if I didn't it would be even more maddening that everybody else seems to think that we are a single entity, like The Blob. For future reference, please try and get to know us, learn our names and find out about what we do. Don't make us have to get identity badges. A website I like very much is AllLookSame which raises great questions about racism, the assumptions people make about appearances, and the way they handle difference. I think about this website quite often, and the phrase All Look Same has stuck with me ever since I first encountered it about ten years ago. I think an All Look Same phenomenon is going on in relation to me and my fat and queer friends. We share many values and ways of seeing things, we like a lot of the same stuff and turn each other on to new things, so in some ways it's not surprising that people see similarities between us. But it's also quite ridiculous and insulting when a stranger insists that you are someone else, especially when you are clearly diverse people with distinct attributes, or standing together in the same room. But it makes me wonder what people really see when they end up in a scene that features a bunch of people who are different to them, and where they are required to address that difference. How come they can't see that we are individual people? What do people see when they see a bunch of rad fatties? We have different hair, body shapes and everything. Maybe the idea that a culture or community of cool fat friends exists is too much to process, maybe people think that there can't be more than a couple of us! Or more than one Beth Ditto? Maybe we're just "the obese". I've no idea. Google notified me that you linked to my site, AllLookSame.com; and it sounded interesting, so I came. "Difference" is an interesting concept, isn't it? We could get offended by people making a distinction or NOT making a distinction. It depends on the context. For instance, if I were to be rejected for a job as a French chef just because I am Japanese, I might feel offended. Yet, if someone were to assumes that I'm a Chinese food delivery boy (Chinese food delivery is common popular here in NYC), I might get offended too. Either way, what is offensive is the assumptions that people make. As you said, some people simply do not care to know anything about you but they are quick to make assumptions about you. That's the offensive part; not whether we all look the same or that we look different. The more we know about the subject, the more distinctions we can make. Since I don't listen to Salsa music, they all sound the same to me. This probably sounds offensive to Salsa fans, but it is actually the truth. That is, to my own ears, they all sound the same because my ears have not been trained to make those distinctions. That was one of the reasons why I created AllLookSame.com. I felt like some people were unfairly being criticized for not being able to tell Asian people apart. If they didn't grow up around a bunch of Asians, that's understandable, and I don't see any reason why they should feel bad about that. So, again, distinction and non-distinction by themselves are not enough to gauge what motivates that person. I don't like to create an environment where people feel that they need to tip-toe around me. So, I often push the boundaries of being offensive. And, if my words or actions do offend people, I quickly apologize and try to learn more about it. I find that most people are very forgiving with this strategy. This puts people at ease, and they feel they could say something potentially offensive in return. Yet, there are still lines to be drawn, and where to draw those lines is quite tricky. As for being obese: I would imagine that it's tricky to balance it as well. Some fat people encourage others to call them "fat" because they don't want the word "fat" to be stigmatized. (Until recently, being "fat" was perceived positively in Japan. Most of the statues of Buddha in Japan are pretty fat whereas Buddha in India is pretty skinny.) But at the same time, depending on the context and usage, the same word can indeed become offensive. It's not easy to manage an identity that is culturally loaded. Dyske, it's excellent to see you over in these parts, thanks for your thoughtful comment. I think your work is as rad as hell. Please keep on doing what you do.